Eggnog Pound Cake is a festive dessert for the holidays. 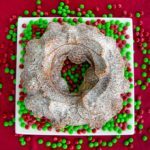 It is a classic southern pound cake flavored with eggnog and baked in a bundt pan. Do not preheat oven. Grease and flour a 10-inch bundt pan. Sift together flour, baking powder, salt, and nutmeg. Using an electric mixer, cream the butter and sugar until fluffy. Add eggs one at a time, beating well after each addition. Add flour mixture and eggnog alternately beginning and ending with flour mixture. Stir in vanilla and brandy (if using). Pour into prepared bundt pan. Put in a cold oven. Set oven temperature to 325°F. Bake for 1 hour and 15 minutes and do not open the oven door during this time. Cake is done when a toothpick or cake tester is inserted into the cake and comes out clean. Cool cake in pan for 15 minutes. Remove cake from pan and cool completely on wire rack. Dust cake with confectioners sugar if desired.